5 | 454 students enrolled. 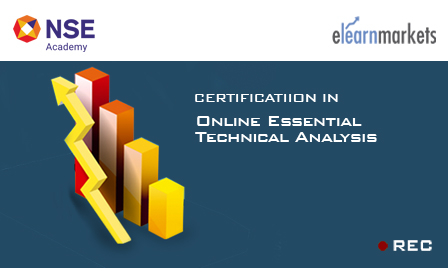 Certification in Online Essential Technical Analysis course is jointly certified by NSE Academy & Elearnmarkets (NSE Academy is a subsidiary of National Stock Exchange of India). What can be more important than knowing when to enter and when to exit in the stock market! Certification in Online Essential Technical Analysis course (listed under Online NSE Academy Courses) can help you master the techniques of doing intraday stock trading very efficiently. Given the volatile nature of capital markets in contemporary times, it is imperative to be equipped with every possible tool available to trade or invest successfully. Technical Analysis is an effective methodology which, if understood well, can allow one to be in a comfort zone in every kind of environment, be it trading range or trending market. The subject, as we are aware, deals with the pricing and chart parameters of a given asset class, be it nifty index, equity, commodities or currencies. Essential Technical Analysis course has been prepared after a very meticulous review of market behavior and volatility. Students will learn the technical analysis of stocks in the form of art of working in Intraday and Positional Trades, variety of techniques for understanding the market behavior and psychology of a normal Investor/Trader and how the stock markets react to this, with the help of charts. Technical analysis of stock market is about the dynamic price movements in the markets which is never the same, but their behavior is! With this programme, we put forward the first step to understand the basics of price movements – Demand and Supply. It will be an insightful experience to test various methods and tools to detect the pulse of the markets and determine the trend in which the prices are moving. It covers various dimensions - from the detection of good, high quality trades to money management skills using risk reward analysis needed for money management and risk assessment. Learning technical analysis of stocks enables students to develop their own intraday/positional trading strategy that aligns with their skill level, capital investment and personal goals using different chart patterns, Fibonacci, trading systems and many other indicators and oscillators. After having completed the course, a student should be well equipped to analyze the trend in which the market is moving and trade both in the equity and derivative segments. Students enrolling for Essential Technical Analysis programme will be given a “Certificate of Participation” from NSE Academy facilitated by Elearnmarkets.com, after successful completion of the course. He shall also be given free access to all webinars conducted by Kredent Academy for further knowledge enhancement. An email query support, Question & Answer community platform will also be availed by the student for any kind of doubt clearance related to content while pursuing technical analysis course. There are technical analysis info graphs designed after each session to ease level of understanding of the students. All the knowledge content is provided by Kredent Academy. Essential Technical Analysis course is useful for freshers who are new to the market and would like to get introduced to the basic market terminologies and concepts and start a new career in the world of capital markets. New Investors, Retail Traders, Brokers and Sub brokers, Financial Service Professionals shall also benefit from this course as it shall enhance their knowledge base, understanding the market dynamics of demand and supply and predict future price movements.